The Arctic is undergoing dramatic changes, including unprecedented decline in sea ice and melt of the Greenland ice sheet. These changes are likely to have dramatic impacts on all of Greenland’s ecosystems including the intertidal (the bit between the land and the sea). In this project we are looking at what lives on the beaches of West Greenland and seeing if there have been any changes, by comparing samples we collect with historical literature dating back over 70 years. Our work has concentrated on two main areas, Arctic Station on Disko Island in the north and around Nuuk and Kobbefjord further south. We travelled to Greenland from the UK (Hull and Cambridge) via Copenhagen. Once in Greenland the planes got smaller and jets were replaced with propellers. The Copenhagen flight arrived at Kangerlussuaq, an airport with two gates, one domestic and one international. We headed north to Ilulussat to catch a ferry (small boat) to Qeqertarsuaq on Disko Island. We have found that travelling in Greenland is very weather dependant and requires a relaxed and zen-like attitude to reaching your destination. 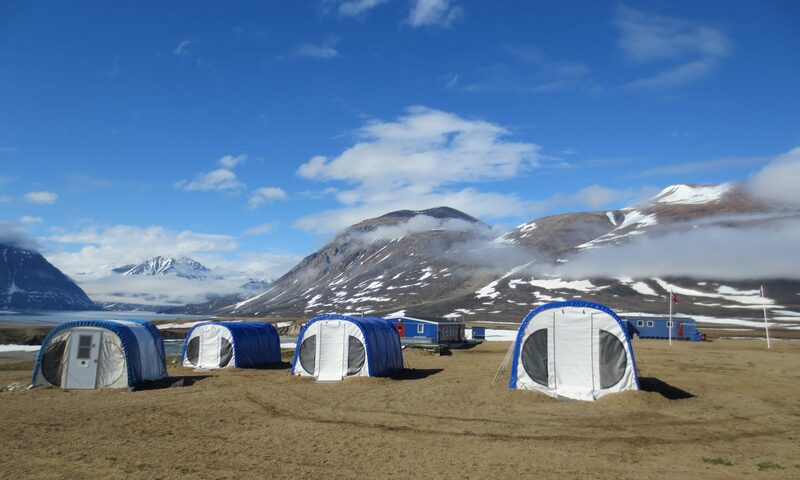 Our first week of science was spent at the Arctic Station on sunny Disko Island, one of the oldest research stations in the Arctic. This beautiful old building (and new laboratory and library) sits right next to the beach and was the perfect base from which to explore the coast and the organisms that live there. The views were spectacular with large, sculptural icebergs forming a backdrop to the sight of humpback whales. The whales were often feeding only a few hundred metres from the shore directly opposite the station. Our second week was hosted by the Greenland Institute of Natural Resources in the capital, Nuuk. Most of our time was spent in the Institute’s field station in Kobbefjord. The field station is a an off-grid wooden structure who’s water comes from a glacial stream and electricity from a generator. The fjord is spectacular with steep mountains, dramatic waterfalls and ever-changing weather. The only other inhabitants were several million midges and mosquitoes, who seemed very keen to get know us. The intertidal habitat here was noticeably different to Disko Island, as Kobbefjord is extremely sheltered and five degrees of latitude further south. We were surprised to find so many familiar species that we recognise from the beaches of the UK. There were some groups of common shore animals that we did not find at all including crabs, shrimps and starfish. All beaches had periwinkles (small sea snails), brown seaweed and edible blue mussels. We now look forward to getting our samples back to the laboratory in the UK to identify the smaller beasties and seaweeds to complete our picture of the diversity of West Greenland’s shores. We also collected samples of sand from every beach to test for traces of pollution such as microplastics. As we pack up our equipment, samples and clothes for the long journey home we want to thank the staff of both institutes for their help and support in making this highly successful expedition possible. We have been fortunate enough to meet some interesting and friendly people on our travels and look forward to ongoing collaborations and friendships.